The dressers are not compatible with AL or MG. Those EPs broke something in my code and I haven't tracked down a work around yet. I apologize for any inconvenience. These contests have finally come full circle for me. I originally entered them to win Numenor's spiffy Magic Plumbob after I read that it would tune into any sim on the lot, even babies. I instantly wanted to see if I could turn it into a baby monitor somehow. With Numenor's permission, blessing, and help I've completed that goal. The TinyTikes Baby Monitor will allow you to monitor any baby or toddler on the lot. It will mimic the child's plumbob above the bear's head to indicate the mood. The little bear head comes in all the same colors as the Maxis Mr. BearyButts chair, if you have any custom recolors of that, it will draw them too. I find that the different colors are an easy way to tell apart which child it is monitoring, or if you only have one little one, then it can easily match the decor of the nursery. My other major break through for this contest is my Kinder Klother Dresser. I've created two versions, one to match the BaseGame nursery and one to match the FreeTime set. Each dresser gives you the option to change your child's clothes and plan their outfits as well. How is this different from the changing table? Well for starters this isn't a changing table. This is a dresser, so your tot had better be potty trained! The awesome thing about it is that you now have the option to change their clothes into their undies, formal, and swimwear in addition to everyday, pjs, and outerwear. Hurray! Now you are about to tell me that tots don't have formal or swimwear outfits. If you have one of my clothing migration mods you might have noticed that your tots have had formal for a while now and I've even promised this was coming but I never got it finished, until now! What about swimsuits? I suggest you take a look at some of fakepeeps adorable swimwear and run them through the Wardrobe Wrangler or use my Catalog Edit tutorial to categorize them. Sadly, even though I've been working on this for over a year I still can not get a working BaseGame version. 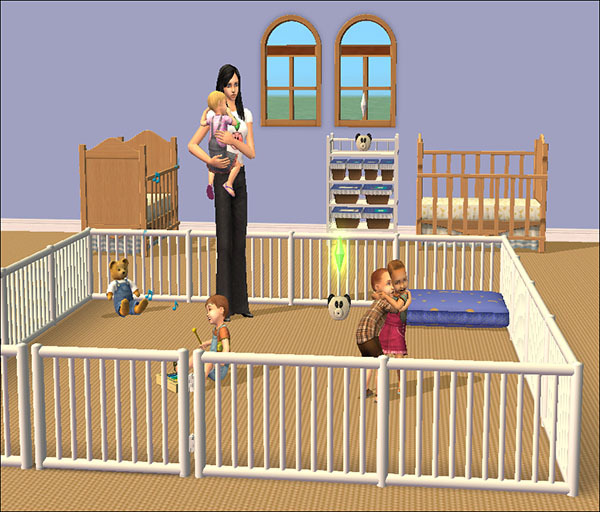 Maxis had really dumb code for the changing table and fixed that with an update in Seasons. For this reason these dressers REQUIRE ANY EP Seasons or above to work. The FreeTime one also requires FreeTime because it draws its textures from there. The other one also draws its texture from the BaseGame table, so there is no need to recolor these to make them match your nurseries, they already do! As a last minute added bonus I figured out how to add a slot on top of the dresser so you can put my baby monitor on top of it, or a plant or some such. Yay slots! Remember, your tots need to have outfits in the new categories before they can change into them! Thank you Jasana, Echo, Manga_Moon, HP, and Pescado! The next fun thing I have for your playing pleasure is a BASEGAME COMPATIBLE fence and toddler-proof gate. The fence has been meshed to look like a playpen and the gate has been edited by Numenor to disallow toddlers to crawl through it but they can still be carried through it! This is the PERFECT solution to keep your tots out of the toilet! Previous solutions were Echo's lovely playpen, but the kid couldn't do anything but sit there. Now you can put toys in their play area and get some useful skilling out of them. Most fences require any EP to work, but this one has been fixed to work for BaseGame. The gate also works without any EPs. Thank you Numenor and Jasana! 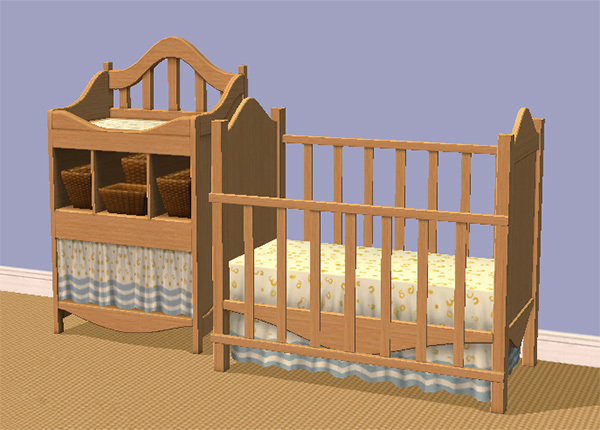 My last present to you is an animated FreeTime crib. As menaceman has pointed out Maxis didn't bother to include the proper animations but he fixed it. With permission I've cloned his fixed version and created a new mesh for it. I've never liked the canopy crib we were given and the silly shape of the sleigh crib was no better. I just wanted a simple clean wooden crib. It pulls FreeTime textures, so it's required. See pic below. My First Time: BHAVs this was the first place I was fiddling with them, haven't gotten much better over the year I'm afraid! Pulling of the Repository technique, most times I've tried have ended in misery. Making a fence and gate. Previous Knowledge: Meshing and a year's worth of how not to make that changing table work. So happy it is done! Compatability: The playpen set is BaseGame. The baby monitor is BaseGame. The white dresser requires any EP Seasons or above (SSN, BV, FT, AL, or MG). The FreeTime Dresser requires FreeTime. The Wooden Crib requires FreeTime. The Sleepy Mat requires Pets and AL. Thanks to my delightful dolls; Fawn, Walt, Avery, and Jackie. And of course Avery and Jackie's parents for photography consent! Gingham Rocking Horse - Complete Nursery & Clothing Collection For Twins - In Two Colours! !